This book seeks to think differently about what we recognize as "global institutions" and how they could work better for the people who need them most. By so doing, the contributions show that there is a group of institutions that influence enough people’s lives in significant enough ways through what they protect, provide or enable that they should be considered, together, as global institutions. The United Nations, the World Bank, the internet as well as private military and security companies leave a heavy footprint on the social, political and economic landscape of the planet. We are all aware in different ways of the existence of these global institutions but their importance in achieving change in the twenty-first century is often underestimated. 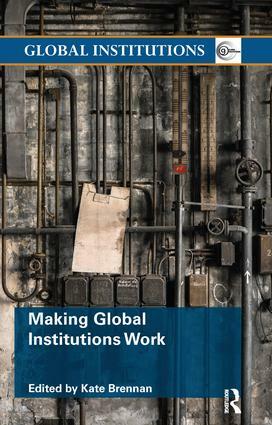 In this book, contributors seek to explain what associations exist between change in global institutions and the reduction of poverty and inequality as well as the achievement of security and justice. The work makes sense of processes of change and identifies the most significant obstacles that exist, offering suggestions for future action that will be of interest to students and scholars of global institutions.